Because out in the wild, size does matter! Now everyone can stand up, stand out, and jump around in our extra-extra tall NEW Sequoia 4 and 6 person tents. Our NEW Sequoia 4 and 6 person tents feels super roomy in the outdoors. With a huge door to welcome everyone in, and a shape designed to accommodate adults 6 feet tall standing upright, it’s not just kids who can have space to have a blast in this tent. I have only used the tent for one canoeing outing and it worked great, There was a driving rain one night and the tent was dry. I also bought the footprint that is made for the tent. I have used a Kelty 3 man back pack tent for the past 15 years and love that tent. Now that I am retired I wanted a tent I could put a cot & chair in to make it easier on this old guy. This tent works great. Plenty of room to spare with a cot, chair & other gear. Being able to stand in the tent to get changed, makes it feel like a cabin. I plan to have my grand children camp with me when they get a little older and will have room for them too. I car camp during the canoe trips, I don't put the tent or gear in the boat so weight is not an issue. The tent is much heavier than my backpack tent, no surprise there, but very managable for car camping. The steel poles are very strong. I need to set-up and take down the tent a few times during the trips. I set-up and take down the tent by myself without issue. Having two people would make it quicker and easier. The vestibule works well for the smelly river shoes, and muddy hiking boots. It will take some more practice for me to fold the fly and tent more effeciently. I had the process for the backpack tent down pat and went very quickly. I also used long heavy steel tent pegs. I like the larger pegs I have used for years, but have no reason to believe the pegs that came with the tent wouldn't work well too. Overall, based on my one outing I am very happy with the size, ease of use, utility, and quality of the tent. 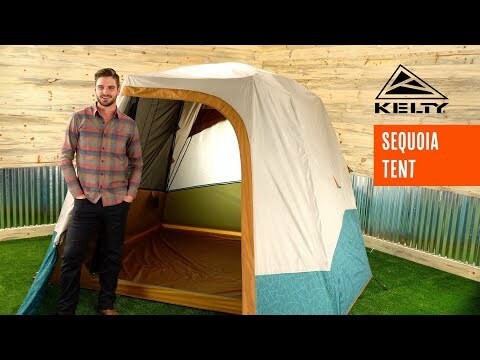 I expect it to give me many years of worry free service like my previous Kelty tent. Bought this tent for rafting and car camping to give us more room than in our backpacking tents. The tent held up well to strong canyon winds, and has performed well on week long rafting and camping trips. Thankfully, I have not yet had a chance to test the waterproofing of the tent, so I cannot comment on this feature. On the down side, the poles are really heavy, and this makes the whole package only suitable for camping with some kind of vehicle support. Secondly, the pegs supplied bend pretty much as soon as you look at them, so purchasing a stronger set of pegs is a pretty good idea. I found that erecting the tent is really a struggle unless you make sure you stake out the corners before you try to insert the poles. The instructions point this out, but I managed to miss this important step and the resulting frustration is not something I would wish on anybody. Once I figured this out, setting up and taking the tent down was a whole lot easier. It is certainly nice to have a helper or two, but definitely not too much trouble for one person once you have practice.